Payment terminals heading for U.S.
Moscow's ubiquitous payment terminals are set to sprout in the United States this year as one of their Russian operators, Qiwi, announced Tuesday an alliance with Japan's business empire Mitsui to enter new markets. Mitsui agreed to buy 14.9 percent of Qiwi, the country's biggest provider of the electronic payment services, from the management and the London-listed Mail.ru Group for an undisclosed amount, Qiwi and Mitsui said. In addition to Russia, the service operates in 15 other countries, including China, South Africa, Romania and several other former Soviet republics. While its focus will stay on the developing nations, Qiwi listed the United States — with its abundance of bank machines and umpteen opportunities to pay with bank cards — as one of the next expansion targets in a presentation distributed to reporters. Mitsui will advise Qiwi on capturing markets where Mitsui has offices, which includes the United States, Qiwi president Andrei Romanenko said by telephone. Qiwi payment terminals — used to pay cell phone and public utility bills, repay bank loans and wire money — account for 45 percent of the payment terminal services in Russia. The service, which Romanenko dubbed a “Russian invention,” largely acts as a substitute for the lack of bank machines and bank card options in emerging markets. The idea to use payment kiosks appeared in 2002 and began developing in 2005, Romanenko said. Credit card payments are declining in the United States, so it would be logical to expand there, said Yuichiro Hanawa, general manager for Mitsui's Internet business second department. But the goal of entering the U.S. market promises to prove challenging for the young Russian company, even with the assistance of its new Japanese partner. Romanenko, Qiwi's president, said Cyprus-registered Qiwi plans to add new services in Russia and establish a presence in at least five new countries every year so as to cover 40 countries by the end of 2015. Some other expansion targets for this year are Brazil, Serbia, Latvia and Vietnam, according to a company presentation distributed to reporters. The investment required to enter a new market does not exceed $2 million, Romanenko said. Qiwi's profit soared to 650 million rubles ($22 million) in the first nine months of last year, from 17 million rubles for the full year of 2007, the company said in its first-ever disclosure of its finances Tuesday. 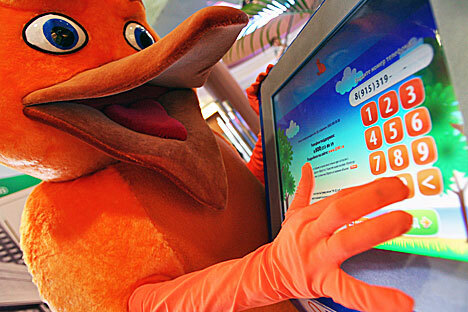 In Russia, 80 million people use Qiwi's 100,000 kiosks every month, it said. “Through its participation in the activities of Qiwi, Mitsui aims to create value in the consumer service sector … through the provision of payment services for consumers in Russia and other markets,” Mitsui said in a statement. Qiwi management sold Mitsui 11.3 percent of its 75 percent stake in the company, while Mail.ru Group proportionately sold 3.6 percent of its 25 percent holding. Mail.ru did not comment on the transaction Tuesday afternoon. Zimbler said it was “clever” to bet on the long-term prospects of the Russian retail sector, which included the fast-growing segment of online sales.